On this date in 1945, Karl (or Carl) Hulten, a 22-year-old American paratrooper, hanged in Pentonville Prison for murdering an English taxi driver for £8. 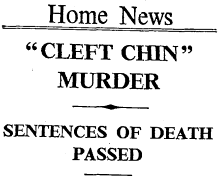 The “cleft chin murder” — so dubbed because the victim had this feature — is explored as extensively as anyone need know about it in George Orwell’s curmudgeonly 1946 essay “Decline of the English Murder”. But that was then. Orwell wants these newfangled atavistic hoodlums and their crummy American films to get off his damn terrace. Now compare the Cleft Chin Murder. There is no depth of feeling in it. It was almost chance that the two people concerned committed that particular murder, and it was only by good luck that they did not commit several others. The background was not domesticity, but the anonymous life of the dance-halls and the false values of the American film. 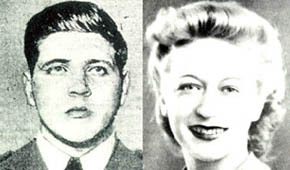 The two culprits were an eighteen-year-old ex-waitress named Elizabeth Jones, and an American army deserter, posing as an officer, named Karl Hulten. They were only together for six days, and it seems doubtful whether, until they were arrested, they even learned one another’s true names. They met casually in a teashop, and that night went out for a ride in a stolen army truck. Jones described herself as a strip-tease artist, which was not strictly true (she had given one unsuccessful performance in this line); and declared that she wanted to do something dangerous, “like being a gun-moll.” Hulten described himself as a big-time Chicago gangster, which was also untrue. They met a girl bicycling along the road, and to show how tough he was Hulten ran over her with his truck, after which the pair robbed her of the few shillings that were on her. On another occasion they knocked out a girl to whom they had offered a lift, took her coat and handbag and threw her into a river. Finally, in the most wanton way, they murdered a taxi-driver who happened to have £8 in his pocket. Soon afterwards they parted. Hulten was caught because he had foolishly kept the dead man’s car, and Jones made spontaneous confessions to the police. In court each prisoner incriminated the other. In between crimes, both of them seem to have behaved with the utmost callousness: they spent the dead taxi-driver’s £8 at the dog races. Judging from her letters, the girl’s case has a certain amount of psychological interest, but this murder probably captured the headlines because it provided distraction amid the doodle-bugs and the anxieties of the Battle of France. Jones and Hulten committed their murder to the tune of V1, and were convicted to the tune of V2. There was also considerable excitement because — as has become usual in England — the man was sentenced to death and the girl to imprisonment. According to Mr. Raymond, the reprieving of Jones caused widespread indignation and streams of telegrams to the Home Secretary: in her native town, “SHE SHOULD HANG” was chalked on the walls beside pictures of a figure dangling from a gallows. Considering that only ten women have been hanged in Britain this century, and that the practice has gone out largely because of popular feeling against it, it is difficult not to feel that this clamour to hang an eighteen-year-old girl was due partly to the brutalizing effects of war. Indeed, the whole meaningless story, with its atmosphere of dance-halls, movie-palaces, cheap perfume, false names and stolen cars, belongs essentially to a war period. 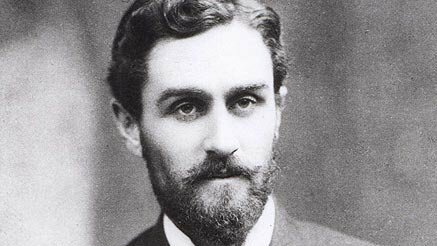 Perhaps it is significant that the most talked-of English murder of recent years should have been committed by an American and an English girl who had become partly Americanized. But it is difficult to believe that this case will be so long remembered as the old domestic poisoning dramas, product of a stable society where the all-prevailing hypocrisy did at least ensure that crimes as serious as murder should have strong emotions behind them. 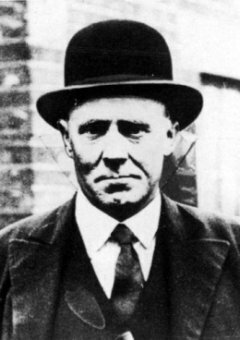 On this date in 1928, Frederick Browne and William Henry “Pat” Kennedy hanged simultaneously (but at different prisons: Pentonville and Wandsworth, respectively) for murdering an Essex policeman. Police constable George Gutteridge was found dead in September 1927 on a byway near Howe Green, dressed in his full police regalia, shot four times in the face while apparently in the process of writing up a miscreant motorist. Frederick Browne (top) and Pat Kennedy. Two of the shots had been through each of Gutteridge’s eyes, conceivably in deference to the ancient superstition that dead men’s eyes preserve the last image they beheld in life. If that was the reasoning, Frederick Browne, the triggerman, was living in the wrong century. The “Gutteridge murder” investigation — a national sensation from the time the constable’s mutilated body was discovered — took several months to hone in on suspects Browne and Kennedy, known car thieves with some history of violence. But the real break in the case was, well, a case: a cartridge case from a .455 Webley recovered at the crime scene. It would be the most eloquent witness against Browne and Kennedy. The now-familiar science of forensic ballistics was, though not quite brand new, still an occult art in Anglo courts of law. 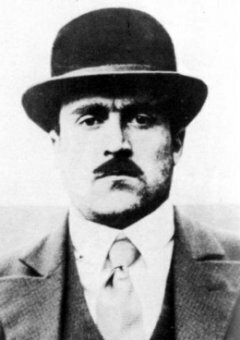 Just days before Gutteridge’s murder, Sacco and Vanzetti had been executed in the United States based in part on ballistics studies. That gun-barrel research had been continued in the post-conviction appeals and clemency investigation, and provided one of the clinching pieces of evidence against the anarchists, but it was also ferociously contested. In Great Britain, it was the Gutteridge case that put this field on the map for the general public — courtesy of professional gunsmith and ballistics investigator Robert Churchill. Churchill used microscope analysis of the recovered casing to match the bullet not only to a .455 Webley, but to the .455 Webley recovered from Browne’s car: to that gun, and no other. Post-Browne and Kennedy, murderers given to gunplay became very well advised to dispose of weapons once they’d been used: this case served notice that individual handguns left a sort of fingerprint on the rounds they discharged, and could thereby incriminate their owners months or years after the fact. This conclusion was not universally embraced, perhaps owing in part to the role of ballistics in the controversial Sacco and Vanzetti affair: according to Basil Thomson, George Bernard Shaw wrote to Browne’s family during the trial to express his skepticism, complaining of the crown’s “manufactured evidence.” In 1932, the renowned barrister Patrick Hastings successfully repelled Robert Churchill’s firearms evidence at the high-profile murder trial of Elvira Barney. But the reason Churchill was on the stand on that occasion was because his damning testimony in 1928, explaining where a small fault in the Webley’s breech block had scarred the bullet as it launched, not only sufficed to hang Browne and Kennedy* — “hanged by a microscope”, in the words of The Sunday Dispatch — but also launched a star career for Churchill personally, and made the bones of firearm ballistics for modern criminal trials. * More precisely, the forensic testimony hanged Browne — who stuck with a flat denial, which the ballistics associated with his own gun refuted. Kennedy lacked the wit to shut his mouth and in the course of trying to spin his story to throw all the blame onto Browne also just by the by confessed to his own involvement. A century ago today, the first Indian revolutionary martyr to be hanged in England was put to death at Pentonville Prison. 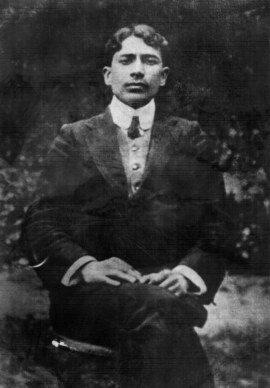 Madanlal Dhingra (or Madan Lal Dhingra) was a bright young scion of a loyalist Indian family that disowned him when he took to radical politics. My only prayer to God is that I may be re-born of the same mother and I may re-die in the same sacred cause till the cause is successful. 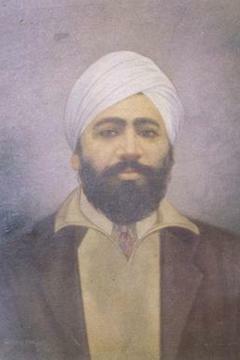 Dhingra is a noteworthy martyr to the cause of Indian independence now, but like anything else things weren’t so black and white at the time. 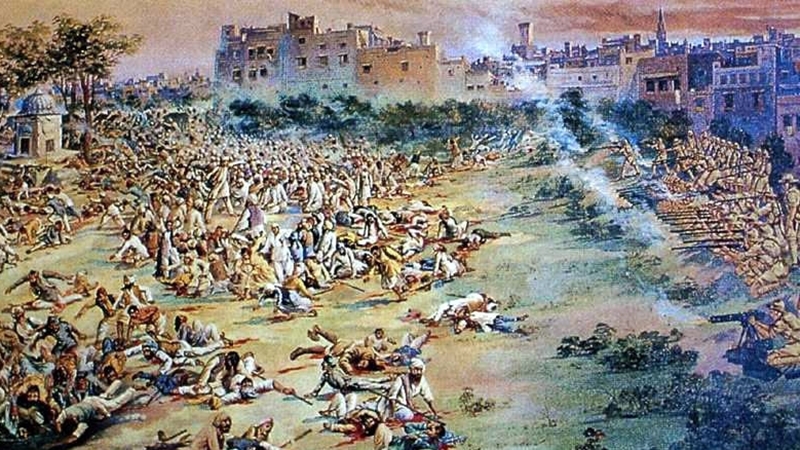 Gandhi was not down with Dhingra — Gandhi’s own differences with Hindu extremists would eventually cost him his life — and plenty of Indian liberal types shared his abhorrence. 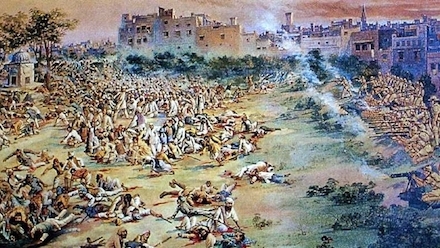 They have done me the honour of choosing [my birthday] for Dingra’s execution, thus making of it an anniversary which will be regarded as one of martyrdom in India for generations. People talk about political assassination as defeating its own end, but that is nonsense; it is just the shock needed to convince selfish rulers that selfishness has its limits of imprudence. Other subjects of the Empire were inclined to agree. 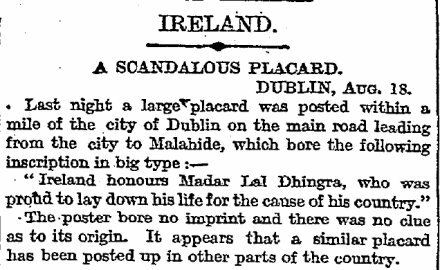 From the Aug. 19, 1909 London Times. On this date in 1952, Irish steward George Muldowney was hanged at Pentonville Prison for the rather pathetic murder of a dashing Polish spy who had survived much greater villains. Allowing that nobody ought to die on the floor of the Shelbourne Hotel with a sheath knife stuck in their chest, Christine Granville in particular really deserved a better exit. 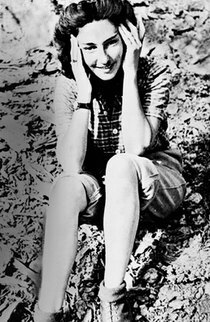 Before the outbreak of World War II, she was Krystyna Skarbek, daughter of a Polish aristocrat sinking into poverty. After Germany overran Poland, she went off the marriage meatmarket and on Her Majesty’s Secret Service for a stunning career as a stunning spy that still has ’em sighing today. Rechristened “Christine Granville” by Britain’s Special Operations Executive, she spent most of the war carrying out feats of cloak-and-dagger derring-do, with a Bond-like aplomb for extricating herself from tricky situations. Commuting between Hungary and Poland by skiing over the Tatra Mountains to gather intelligence and pull other agents out of harm’s way. Getting herself and a fellow agent released from arrest by feigning tuberculosis by chewing her tongue until it bled. Escaping capture at a checkpoint by pulling the pins on two grenades and daring the guards to shoot her. Marching alone into a not-yet-liberated concentration camp to have POW’s reprieved from execution — by telling the Nazi commandante that he’d get the same treatment unless he spared them. 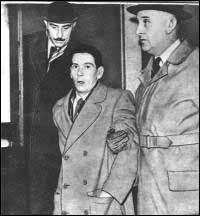 Snatching spymaster Francis Cammaerts from the Gestapo ahead of his execution. And the love affairs! Or that’s what they say — including fellow agent Ian Fleming. Granville earned the French Croix de Guerre, the George Medal for Special Services, the Order of the British Empire and other decorations, although merely surviving so much time in the field might have been her greatest achievement … but when the war ended, she was just another unwelcome Polish refugee, scrounging for service work in a recovering economy with no welcome waiting for her in her Soviet-dominated homeland. From here on in, the trite and the tawdry eclipse the heroic. A stewardess gig on a cruise ship attracted the attentions of her eventual murderer; his crush unreciprocated, and her companionship with another man jealously noticed, Muldowney stalked her and — on the very eve of Granville’s departure to reunite with a wartime confederate/lover — murdered her at her Kensington hotel. To read the London Times‘ accounting the last moments of this woman so recently outfoxing the Nazis is to behold the face of banality triumphant. He then says: ‘Then I took the knife from the sheath which I had in my hip pocket and stabbed her in the chest, and then somebody came up. '” It was a deep stab wound up to the hilt of the knife, and penetrated the heart. Muldowney didn’t fight the charge; he’d been planning to poison himself after the murder, and tried it when he was in custody. He declined legal aid and pleaded guilty at trial, seemingly eager to expiate his sin or join his would-be lover in death. It was less than 16 weeks after the crime that he stood on the gallows. She — Christine, not Vesper — is buried under a spadeful of symbolic Polish soil in St. Mary’s Roman Catholic Cemetery in London.